Our first match of the season was at home against Lincolnshire at Lingdale Golf Course. The weather was beautiful, the sun was shining and the ball was running well. The course was in great condition with good receptive greens. We felt extremely positive inspired by England’s successful run in the World Cup. We had a very strong start in the opening morning foursomes matches. Alison Smith and Alison Horak lost, Karen Bonser and Rachel East won, and Sue Holwell and Barbara Suffolk both Lingdale members won to give Leicestershire & Rutland a 2-1 lead. The afternoon singles were very close and nail biting, half of the matches were decided on the 18th green and the final result could have gone either way. Our ladies fought hard to secure 2 halves but unfortunately one match swung in Lincolnshire’s favour and the final score was Leicestershire & Rutland 4 - Lincolnshire 5. 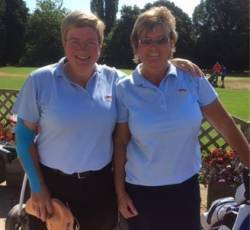 All of the matches were played in good spirit, it was a great advantage having Lingdale members Sue Holwell & Barbara Suffolk in the team both maintaining clean sheets. It was lovely to see so much junior talent being developed and nurtured by the Lincolnshire team and we look forward to seeing some of our Leicestershire & Rutland juniors playing for us in the future soon. Well fought team Leicestershire & Rutland.